The US calls it a war on terror. In reality it's a war of terror. And for every innocent person killed, hundreds of friends and family members hold it against the US. The Guardian reports 41 Men Targeted but 1,147 People Killed in US Drone Strikes. However many Americans know who Zawahiri is, far fewer are familiar with Qari Hussain. Drones first came for Hussain years before, on 29 January 2008. Then they came on 23 June 2009, 15 January 2010, 2 October 2010 and 7 October 2010. Finally, on 15 October 2010, Hellfire missiles fired from a Predator or Reaper drone killed Hussain, the Pakistani Taliban later confirmed. For the death of a man whom practically no American can name, the US killed 128 people, 13 of them children, none of whom it meant to harm. The human-rights group Reprieve, indicates that even when operators target specific individuals – the most focused effort of what Barack Obama calls “targeted killing” – they kill vastly more people than their targets, often needing to strike multiple times. Attempts to kill 41 men resulted in the deaths of an estimated 1,147 people, as of 24 November. There is nothing precise about intelligence that results in the deaths of 28 unknown people, including women and children, for every ‘bad guy’ the US goes after,” said Reprieve’s Jennifer Gibson, who spearheaded the group’s study. Available data for the 41 men targeted for drone strikes across both countries indicate that each of them was reported killed multiple times. An analytically conservative Council on Foreign Relations tally assesses that 500 drone strikes outside of Iraq and Afghanistan have killed 3,674 people. We don’t just fire a drone at somebody and think they’re a terrorist,” the secretary of state, John Kerry, said at a BBC forum in 2013. “President Obama needs to be straight with the American people about the human cost of this programme. If even his government doesn’t know who is filling the body bags every time a strike goes wrong, his claims that this is a precise programme look like nonsense, and the risk that it is in fact making us less safe looks all too real,” Gibson said. Why Do You Kill My Family? 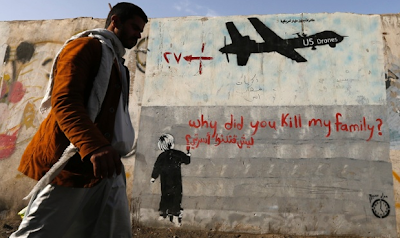 Does US Drone Policy Make Any Sense? We have not killed the 41 we are after, but we have made thousands, if not tens-of-thousands of new enemies in the process. You know the unfortunate answer. For those who want perpetual war, the policy is a blazing success.